For quality construction, vast product line, unparalleled customer service, and extensive warranty coverage look to made-in-America Sure-Trac for all your hauling needs. Sure-Trac is the fastest growing open trailer product line in the US. From landscape and utility trailers to car haulers, enclosed, dump and tilt bed trailers, Sure-Trac offers a trailer to meet your needs – all manufactured with Sure-Trac’s “Professional Advantage.” Through out the Sure-Trac organization, committed professionals are uniquely focused on providing a superior product. From pre-weld to completion, each trailer undergoes six documented quality inspections to ensure the trailer you get exceeds your expectations. 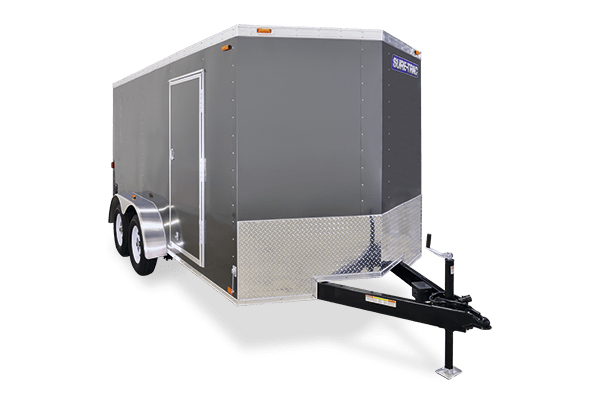 Whether you need a new trailer to haul a prize show car, require a reliable equipment hauler or need a utility trailer for your small business, Sure-Trac builds a quality trailer for your needs. 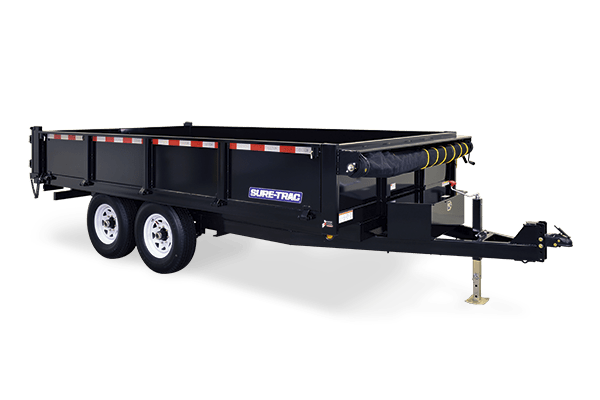 Sure-Trac produces a full line of hydraulic dump trucks, landscape and utility trailers, car and equipment haulers, deckover trailers, and a full line of enclosed trailers. Can’t find a trailer for your work or recreational needs from the vast Sure-Trac product line? Turn to Sure-Trac Custom Trailer Operations. In the Sure-Trac CTO, every trailer is hand-fitted by highly skilled craftsmen using state-of-the-art technology. 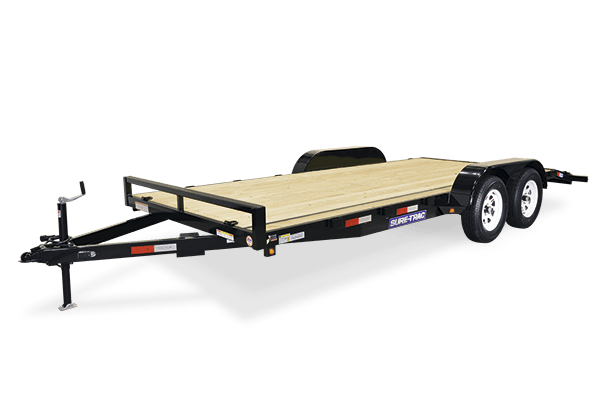 Custom trailers redesigned by the degreed Sure-Trac engineering staff, equipped with the latest engineering 3-D Solid Modeling software to turn your dream trailer into reality. No matter what Sure-Trac trailer you choose, exclusive Steel Prep technology ensures the highest quality and delivers the best value for your investment. Haul with confidence when you choose a Sure-Trac. Each trailer comes loaded with an industry-leading warranty, including three-year frame and component overall protection, one-year tire hazard and abuse protection, five-year standard tire warranty, and five-year axle and suspension warranty. Sure-Trac trailers are manufactured in America’s heartland by American workers using state-of-the-art automated assembly lines. Sure-Trac was acquired by Novae Corp., one of the best professional trailer manufacturers in North America. Founded in 1995, Novae acquired the assets of Sure-Trac trailers and in 2001 began producing their first trailers. Through innovative designs, steadfast attention to detail, and best business practices, Sure-Trac quickly gained advantage in the utility trailer marketplace. In 2005, Novae opened its manufacturing compound in Markle, Indiana, where today Sure-Trac trailers are designed and produced. Shop for your Sure-Trac at M&G Trailer Sales and Service of Minnesota, one of Sure-Trac’s quality dealers in an exclusive network of dealers known for outstanding service, knowledge, and responsiveness. M&G Trailers Sales & Service offers a full-line of new and used utility, cargo, dump, equipment, ATV, and snowmobile trailers, service and repair, parts, and rentals. Look for a huge selection of new and used Sure-Trac trailers at M&G Trailer Sales and Service, including the highest quality utility, dump, car haulers, and equipment trailers.